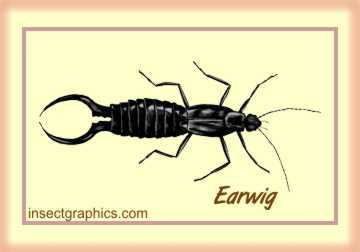 Earwigs are small to medium sized, elongated and flattened, dark red-brown to black insects. They are easily identified by their pincer-like appendages called �cerci.� Amaze your friends—you can tell the males from the females! The males have more robust, curved cerci (like the one in this drawing); those of the female are straight. These forceps are used for defense, during courtship, and even to carry things. Earwigs are harmless to people, although they may give a nip if handled roughly. These insects are called earwigs because of a myth that they crawl into the ears of sleeping people, and burrow into their brains. This is not true. They do, however, like dark moist places. They are nocturnal, and may be attracted to lights. During the day they hide under mulch, boards, stones or debris. They may go into houses searching for cool moist conditions. Many earwigs are scavengers, feeding on decaying plant materials and dead insects. Some earwigs are predators, feeding on live insects, and others feed on living plants and may become pests, especially on tender young plantings. In temperate climates, the adults overwinter in the soil. They may burrow as deep as 6 feet to escape the cold. In the spring, the female lays her eggs in a burrow or crevice. Unlike most insects, she actually takes care of the eggs, turning and cleaning them, until they hatch, and then tends to the young for a short period of time, until they leave the nest.